Born Antonio Tavaris Brown Sr. this NFL wide receiver professionally known as Antonio Brown was born in Miami Florida to Adrianne Moss and Eddie Brown on the 10th of July 1988. His father also played football but not American football like his son; he played Arena football and is considered the best player of all time. Eddie Brown played college football for Louisiana Tech and was a wide receiver for the Albany Firebirds during his active days. With a father who played football and was the best at it, it was almost normal for Antonio to develop an interest in the game of football and he did, but unfortunately, his father was not available to give him all the guidance he needed at the time. 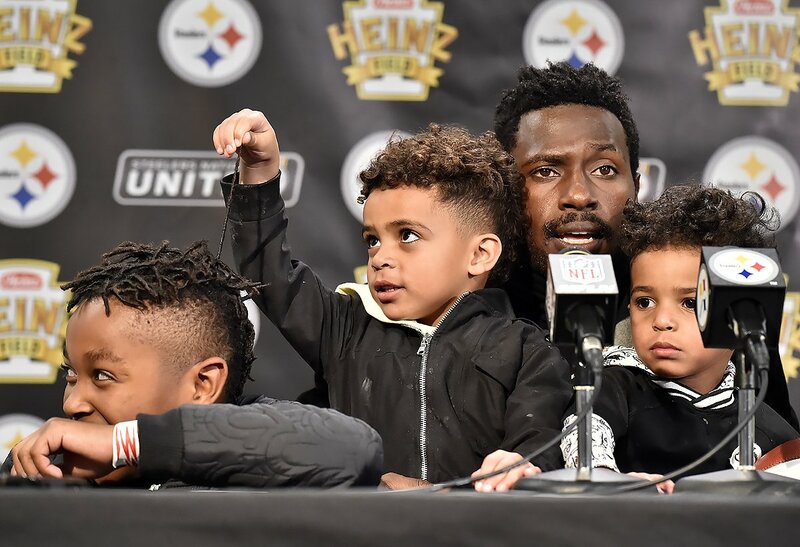 Antonio Brown grew up in the Liberty City neighborhood of Miami with his mother and stepfather and played for T. Y. Hilton’s father (Hilton is an NFL wide receiver who currently plays for the Indianapolis Colts). He attended Miami Norland High School, Miami, Florida, where he did not only play football but also ran track. As a football player, he played both as a running back, a wide receiver, punt returner, and a quarterback, and won the Class 6A all-state selection twice, at the 2005 Miami-Dade Gridiron Classic, he was named North Athlete of the Year. As a track athlete, he qualified twice at the state level in the 100-meter dash, he ran the 4th leg on the Norland 4 × 100 m relay squad, for which they won the state title. After high school, he spent a year at North Carolina Tech after Florida State University denied admission over academic concerns. At North Carolina Tech, he played five games as a QB and rushed for four hundred and fifty-one yards and thirteen touchdowns, he also passed 1,247 yards with eleven touchdowns. At the end of his lone season at the Tech prep, he received a scholarship offer from Florida International University but was sent off even before he resumed following an argument with the security. Following his expulsion, Antonio Brown reached out to Butch Jones, who was a former wide receivers coach at West Virginia but had become a head coach at Central Michigan at the time. He got enrolled at the school and joined the football team as a walk-on freshman. At Central Michigan Brown had to transition from playing the QB position to playing as a wide receiver. After a few weeks, he was offered a scholarship. As a freshman, he played fourteen games and recorded one hundred and two receptions for 1,003 yards with six touchdowns; this record led the Mid-American Conference that year (2007). He also won the Mid-American Conference award for Freshman of the Year and was also the All-Conference as a returner. As a sophomore, he started all of the games he appeared in and at the end of the season, he made ninety-three receptions for nine hundred and ninety-eight (998) yards and 7 touchdowns. He finished his junior season with one hundred and ten receptions for 1,198 receiving yards and 9 touchdowns. 2009 was Brown’s last season with his college team, in January 2010, he announced he was forgoing his senior season to enter for the 2010 NFL Draft. Following a trade pick with the Arizona Cardinals, Pittsburgh Steelers selected Brown as the 195th overall pick in the 6th round of the 2010 NFL Draft. He was the 22nd out of the 27 WRs that were selected that year and the second to be selected by Steelers that year after Emmanuel Sanders. Brown signed a 3-year contract with the Pittsburgh Steelers worth $1.28 million, which came with $73,075 as a signing bonus. 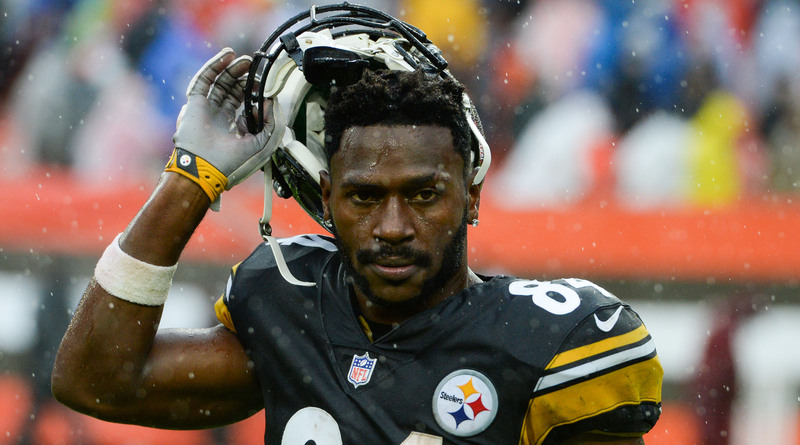 At the end of the preseason camp, Antonio Brown was named the team’s 5th Wide Receiver behind the likes of Mike Wallace, Arnaz Battle, Hines Ward, and Antwaan Randle El. He made his debut with the team in September in a game against Tennessee Titans where he recorded 2 kicks and a punt for one hundred and twenty yards and an eighty-nine-yard touchdown from a reverse. His first career catch came the following month, in a game against the Baltimore Ravens, he made a 6-yard gain. His rookie season ended with sixteen receptions for one hundred and sixty-seven yards in 10 games. In 2012, he signed a five-year contract extension with the franchise worth $42.5 million which included $8.5 million as signing bonus. Before the regular season began he was the starter at the position to begin the regular season alongside Wallace. In November, he was fined $10,000 for unsportsmanlike conduct during a game against the Washington Redskins in which he also sustained an ankle injury that would keep him away from three games. Brown had a very successful 2014 season that earned him a 3rd Pro Bowl selection and a place among NFL Top 100 Players of 2015. He was No. 8 on the list. During the 2015 season, he suffered a concussion which kept him away from just one game, that notwithstanding, at the season, he was named to his 4th career Pro Bowl and his 3rd in a row. He also got his 2nd first-team All-Pro, was ranked among the top WRs and was named the 4th best player on NFL’s list of Top 100 Players of 2016, a position he maintained the following year and the next (2017 and 2018). In 2018, he was ranked the 2nd best player, as well as the best Wide Receiver in the League. In that same season, he recorded his ten thousand career receiving yards. Following his 5-year contract extension with the Steelers in 2017 worth $68 million, with $19 million guaranteed at signing and $17 million annual tag (which will last till the end of the 2021 season), Antonio Brown is currently the highest paid Wide Receiver in the league. His net worth is currently estimated at $30 million by Celebrity Net Worth. The Wide Receiver has never been married and is currently not married, however, he has been in a handful of relationships. The most recent and popular is the one with Chelsie Kyriss. Kyriss is from Springboro, Ohio and has two children from her previous relationship. The couple has been together for a while now that friends to the couple are asking them to get married already but it is obvious the lovebirds are still enjoying their romance together and taking their time. Antonio has his own children too. The WR is a father to five kids, three of them (Autonomy, Ali, and Apollo), he had with Kyriss. Two (Antonio Jr and Antanyiah) he had with his ex Shameika Brailsford.